I recently finished Michael Tymn’s book, Dead Men Talking: Afterlife Communication from World War I. The book is a review of channeled messages received from newly fallen soldiers in The Great War. Two of its most interesting features are the variety of messages and views, and the strange mixture of sophisticated accounts of the afterlife with simplistic accounts. But what is fascinating is how these dead soldiers continued to interact with the battlefield, swiftly coming to the aid of comrades who are either dying or have just died. We get a glimpse of what war is like from the point of view of those who just died. Some offer their understanding of the purpose of World War I, from their perspective. And we learn how some soldiers adjusted quickly directly after their deaths and some did not. Those who did, immediately began rescue work for those who were dying in battle. Those who did not were helped with compassion and understanding. Below is the same story from the same war, but told from the other side, the side of the living who experienced the help of these dead soldiers. Put together with the channeled information in Tymns’s book, we have a more complete picture of how dead soldiers work to combat the horrors of war. Sadly, we do not have much of this kind of information from soldiers in later wars, despite the tremendous amount of extraordinary channeling during World War II. So many soldiers today who still suffer from their experiences in wars since Vietnam would be greatly helped if they were more aware of the compassionate otherworldly activity that typically goes on in the battlefield. The article entitled, “Soldier diaries tell of ghosts intervening in First World War: Canadian historian,” was first published in Canada’s “National Post,” May 28, 2014 and is written by Tristin Hopper. More than 8,000 academics are gathered at Brock University in St. Catharines, Ont., this week for the annual Congress of the Humanities & Social Sciences, presenting papers on how we live, love, learn and clash. Over the coming days, the National Post will highlight some of the most compelling research. Today, Tristin Hopper looks at belief in the supernatural as evidenced in First World War diaries. Outside the Belgian city of Mons in August 1914, as the British Expeditionary Force was thrown into its first major engagement, legend has it the “Angels of Mons” — a battalion of phantom longbowmen — swept down to help the outnumbered Brits hold off the Germans. In the century since, the popular legend has largely been discounted as mere rumor and literary invention, but archival research by Canadian historian Tim Cook has found First World War diaries are more rife with supernatural encounters than one would expect. 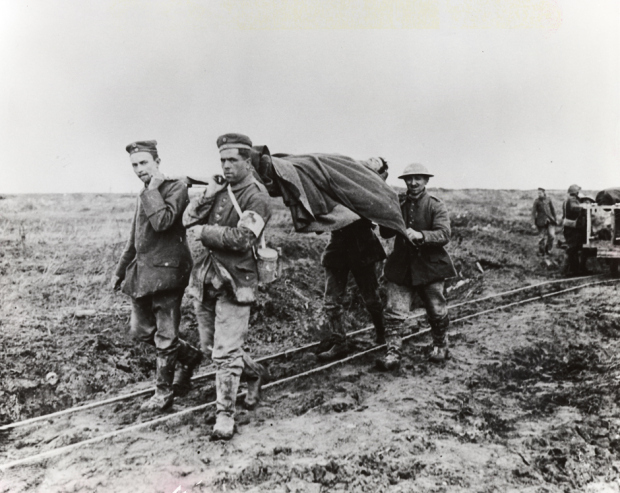 “There are spectral visions; people see ghosts, they see images of their mothers, they see dead comrades,” said the Canadian War Museum historian and the author of the First World War histories Shock Troops and At the Sharp End. He told conference delegates about the “dozens and dozens” of supernatural accounts he has unearthed in 20 years of studying diaries, letters and memoirs. One of the most vivid accounts comes from Ghosts Have Warm Hands, a memoir by Canadian veteran Will Bird published in 1968. Its defining moment comes when the writer, sleeping in a dugout, describes how he was awakened by the ghost of his brother Steve, who had been killed two years before. “Steve grinned as he released my hands, then put his warm hand over my mouth as I started to shout my happiness,” he wrote. Saying “get your gear,” Steve gestured for Mr. Bird to follow him before disappearing. Moments later, the shelter in which he had been sleeping was hit by a shell. Other accounts found by Mr. Cook reported a “calming presence.” Seconds after a shell explosion buried him in corpses during the 1916 Battle of the Somme, Wallace Reid crawled out to find the battlefield had become silent. “I waited, scarcely breathing, for something — waited, it seemed minutes that could only have been seconds. Then it came — invisible, intangible, but nevertheless, very real. Something came to that place of desolation, stopped a moment and passed on again,” he wrote to his mother. One Canadian infantryman, Glenn Iriam, also described the otherworldly feeling of surveying a devastated battlefield. Premonitions were also rampant. Mr. Cook uncovered numerous accounts of soldiers describing comrades becoming eerily certain that they would not survive a coming battle. So many bodies piled up in the cramped trench systems of the Western Front that it was impossible to bury them without skulls or skeletal arms eventually popping out of earthen walls. In nearby No man’s land, meanwhile, the smell of thousands of rotting corpses was so pungent that fresh troops found themselves unable to eat. “Not only are these guys living on sites of mass murder, but they are literally cheek to jowl with the dead,” said Mr. Cook. Front-line troops were also sleep deprived, sometimes going up to five days without sleep, a condition known to induce hallucination. But to Mr. Cook, the supernatural accounts of the Great War—an oft-overlooked aspect of life in the trenches—should be given their due as much more than deranged aberrations. Until their dying day, many veterans who would never report another spiritual encounter still held fast to the belief that they had seen something ethereal on the battlefields of France. “I don’t think it’s just sleep deprivation, I don’t think it’s just tired guys, and I don’t think it’s soldiers trying to trick people in letters; I think that they actually believe in this,” he said.